Galley Wench Tales: Oceana: What Ever Happened to…. Designer coffee from one of Auckland Parnell neighborhood’s weekend farmer’s market vendors with a sit-down cafe. $4 NZD. Auckland, New Zealand. Is there a choice? Coffee. 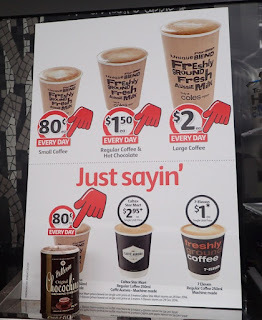 Just a plain, cheap, $1 cup o’ joe. Remember when you could get a simple heavy white ceramic mug, filled from a coffeepot, which you could drink black or add your own cream or sugar? 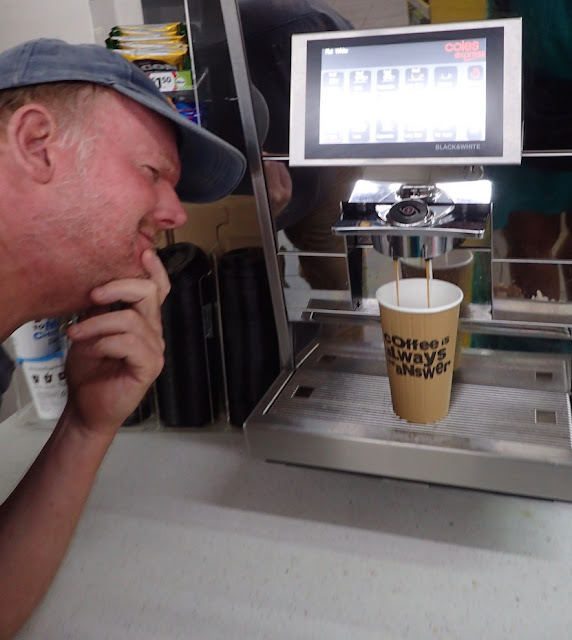 Wayne, fascinated by this self-serve coffee machine in a Cole’s Express gas station convenience store. You didn’t have to use all those fancy terms like “long black” or “latte” or “flat white.” It didn’t take a high tech machine. Servers weren’t called “baristas” (rhyming with “artistsa”*) or required to form a delicate heart over the top of your coffee. It didn’t cost $4-6. *My apologies to those who have, are currently or aspire to barista status. This is no slam on their contribution, merely my desire for a bit more simplicity and correspondingly less impact on my finances from go-go juice. Usually, too it came with at least one free refill, or even as many as you wanted. 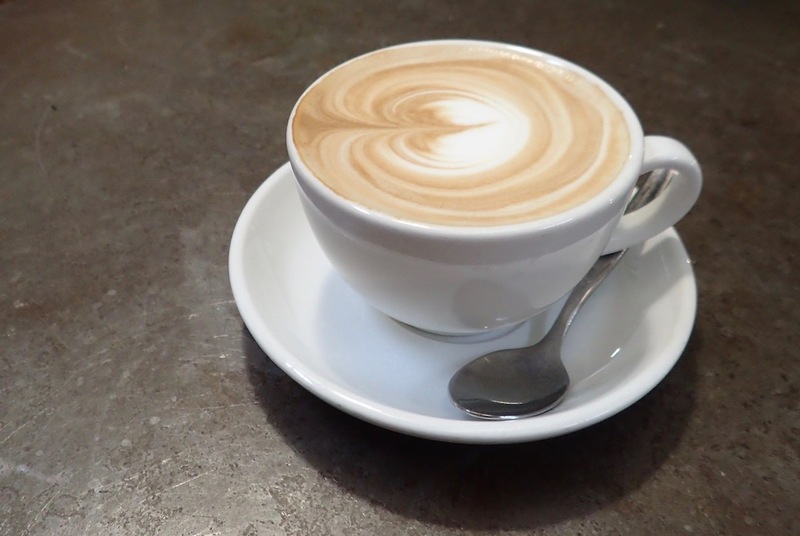 Admittedly, one barista-style coffee benefit: it is much tougher to find a bad cup of coffee these days. 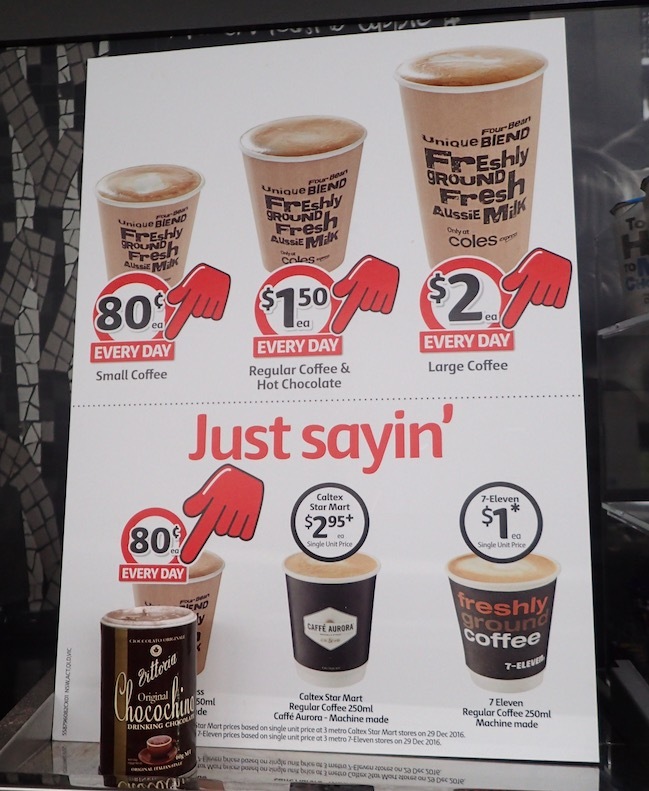 Is it only Australia and New Zealand that regular old coffee has gone the way of the dinosaur? Is it only me who laments their passing? This morning, we went with the most cost-effective option of all - we made our own coffee (and in my case, Tipu's Chai tea - a wonderful alternative to the typical disgustingly over-sweetened coffeeshop chais). convenience store. Gosford, NSW, Australia. Journey is officially SOLD as of 17 Jan 2017 in Newport NSW Australia. More on that soon. Meanwhile, we're back in Oz and at this moment in a small town called Meredith outside Melbourne, Victoria, getting some wifi done. We're looking for a 4-wheel drive Toyota Land Cruiser wagon to replace our van-camper conversion as we've decided it's what we need to go where we want to exploring Australia. Still lots of catch-up blogs coming. Thanks Rob Plowman - for getting my Mac not only fixed, but running the best it ever has - and convincing me to use my iPad, too! That makes getting future blog post done a whole lot easier!